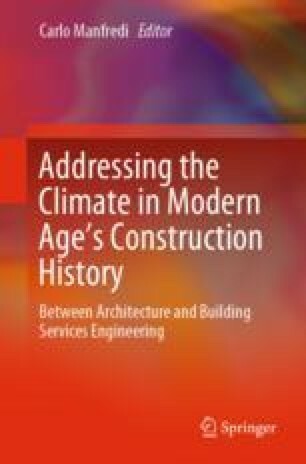 This contribution explores the mutations and adaptations provided by the appearance of building services engineering on the architectural scene, since the end of eighteenth century. It try to open new perspectives on construction history by depicting the state-of-the-art information of recent studies and researches in the field of environmental approach to the architectural history, particularly in health and comfort technologies. It shows how mechanisms that connect (ancient and new) buildings and the environment should be well-mastered, and steer our behaviour in future choices, especially rethinking new uses of built heritage. As well as in structural interventions, new arrangements shouldn’t obliterate the past lives, material tracks and marks on the architectural legacy. This contribution was translated by Pierfrancesco Sacerdoti.